The annual autumn haze in South Korea has settled over Seoul earlier than usual this year. For the fourth day in a row Thursday, officials issued a fine dust advisory and urged residents to stay indoors to avoid severe air pollution thought to be blown over from China, YTN reported. Conditions improved slightly as the week wore on, but the smog levels were still considered the worst yet this season. The weather was nothing new: It happens every year when temperatures drop and the Chinese begin using fossil fuels to heat their homes, Chosun Media reported. Discharge from South Korea's coal power plants contributes to the pollution. The fine dust particles from both sources get trapped in the air over Korea if there's not strong winds to blow them out, but usually this doesn't occur until November. The conditions coincided early, especially with no rain in the region. 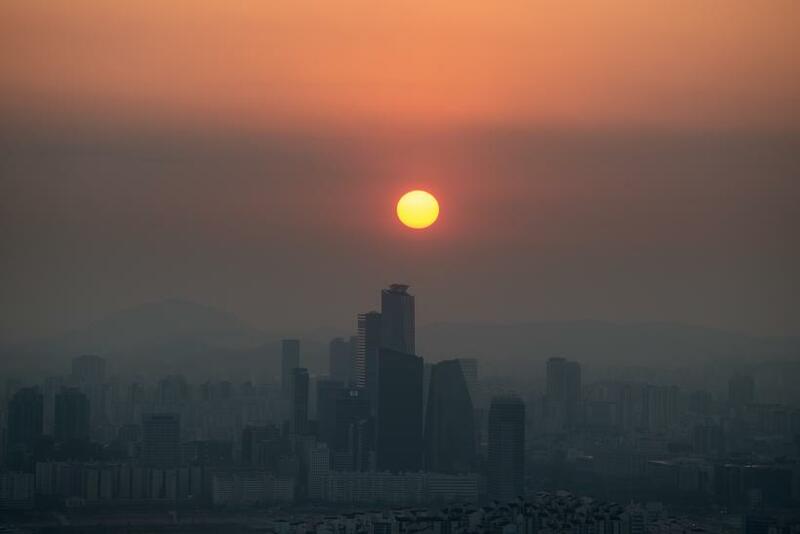 Weather warnings began Monday, when the average concentration of particles was 93 micrograms per cubic meter in Seoul and 111 in Incheon, according to Chosun. AirNow's Air Quality Index classifies anything under 50 as "good," 51-100 as "moderate" and anything over 101 as "unhealthy." Too much exposure can irritate people's eyes, lungs and throats. By Thursday, Heungdeok-gu had reached levels up to 216 micrograms per cubic meter, causing the government to suggest young and elderly residents wear masks, Yonhap reported. “My bronchial tubes are in a weak condition, and my throat feels very bad when I am outside," Kim Bo-yeon told Voice of America last year. "I'm worried about my health, so I bought masks and came out." Korea wasn't the only area in Asia battling poor air conditions this month. Malaysia and Singapore have recently been forced to warn residents and close schools due to forest fires in Indonesia.